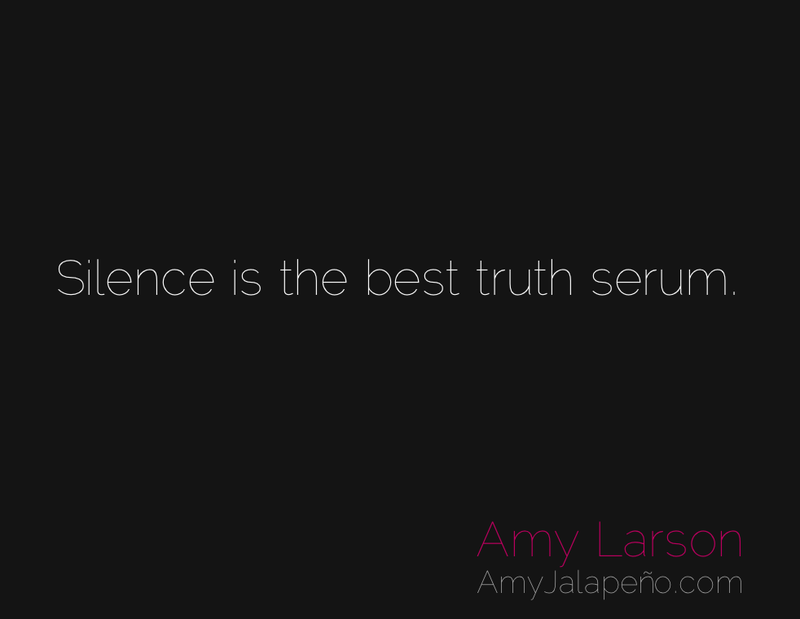 do you allow time for truth to exist? (daily hot! quote) – AmyJalapeño! Many things interrupt our moments of silence: family, friends, work, cell phones, even our internal dialog. And some of it is necessary for us to evolve and accomplish things; but we allow the interruptions too often. So often, that our identity blends in with the distractions until we don’t know the difference between us and them, when we can’t imagine our lives without them. It’s like we become the framework for the distractions, moved only by their master puppet strings. When we consent to silence, we allow space for the truth of things to arise. Silence allows us to dive through the external, surface noise, and all the varied perceptions of things. It shows us what is real, what is authentic, what we can count on most. It is our most faithful companion. Silence shows us a way through all of the varied emotions, cuts through all of the distractions, introduces us to our strength. The best thing about silence is that it is available to us at any time, in any place, and in the presence of any person. I have weaved in and out of the bustling throws of Times Square in New York City and experienced internal silence. The contrast was quite a beautiful experience. I can see how people might be scared to explore silence, because it allows for anything to come up and oh my god, then you would have to deal with that monster of a thing. But really, when you are there in it, that is not what actually happens. You are not dragged down to hell by a psychological balrog. The silence dissolves those big internal uglies. There is nothing to be afraid of. Really. Extroverted personalities have the most difficulty with this. I spend one to three hours everyday with ‘the silence’ and is how I regenerate. The cacophony of noise we exist in today blinds us to the path and all to often wander in circles because of it.